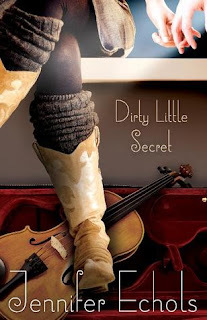 Dirty Little Secret by Jennifer Echols ~ Love.Life.Read. Reviewed from: a copy provided by MTV Books—Thank you!! At one time, Bailey and her younger sister Julie used to play the bluegrass festival with their parents. They had dreams of being discovered together, getting that record deal to take them to the next level. What happens though, instead of them being signed as a duo, Julie is signed and the record company advises their parents to keep Bailey in the background essentially. Bailey is sent to live with her grandfather after senior year in high school. Rebelling during senior year, Bailey admits she made some wrong choices in hopes of getting her parents to pay attention to her. When her grandfather helps her to get a job as a traveling musician in the mall tribute bands, Bailey jumps at the chance to play her fiddle. During her first week she meets Sam, a boy with undeniable talent. He convinces her to play in his band, convinced she is what they need to take his band to the next level. During their playing together, Sam and Bailey cannot deny their growing attraction. Bailey has not really dated until this past year and it was with loser guys. Sam does not seem like such a guy but then she finds out that he jumps from one girl to the next. Both of them carry a hurt so deep that it will take them standing up to themselves and their parents to be able to take that next step in their lives. This is the first time I have read anything by Ms. Echols though I have had her other titles on my to-be-read list for ages. I was immediately drawn to this after reading the synopsis and I am happy to say that this book lived up to the description and more. The emotions that Bailey and Sam emit are so authentic and believable that I felt like I was living through it with them. Each time I had to put the book down to carry on with real life had me starring longingly at it, wishing I could immerse myself with Bailey, Sam and their passion for music again. This is a fantastic read! I cannot recommend it enough. Feature & Follow: What Do You Do with Your Books? Cover Reveal: See Me by Wendy Higgins!!! Love Him or Leave Him Launch Day Giveaway!